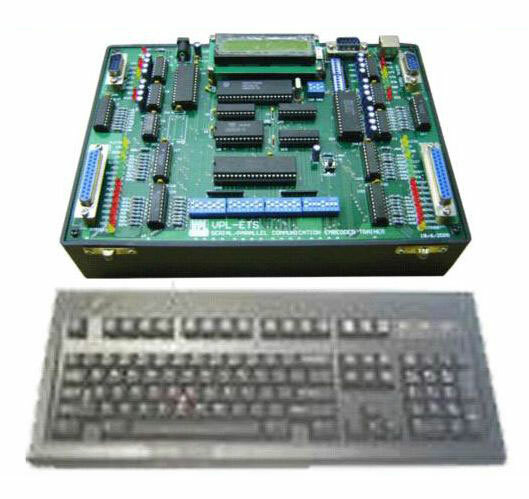 VPL-ETS Parallel Communication Embedded Trainer has been designed by using Philips Microcontroller. Parallel Communication Embedded Trainer provides in-system as well as in application programming so that one may be able to write program and download directly in the controller through serial or parallel port without removing it from the system. Parallel Communication Embedded Trainer allows you to study the serial/parallel communication in detail and transmit data. The in-system programming (ISP) is performed without removing the microcontroller from the system. ISP facility consists of a series of internal hardware resources coupled with internal firmware to facilitate remote programming of controller through serial/parallel port. The ISP facility has made in circuit programming in an embedded application possible. The ISP function uses five pins TxD, RxD, Vss, Vcc and vpp.